Spread around. Lumpen-proletarian rebel arrested recently in Oakland, CA USA at anti-police demonstration. Squatter and anarchist. Facing serious charges. Help get word out. Dante Cano is currently being held in Santa Rita jail for participation in a demonstration against police brutality and murder in the Bay Area and across the United States. At the time of his arrest, police in near-by Emervyville had just killed Yuvette Henderson in early February. At the same time, police also had just shot people in San Jose, East Oakland, and also the courts had exonerated the police that shot and killed Alex Nieto in San Francisco. This happened against a back-drop of ongoing police murder and violence across the US as well as a deep and furious revolt in the Bay Area against this murder and repression. Since the revolt against police and racist murder began in the Bay Area in the winter of 2014 – police have specifically targeted young people, just like Dante Cano. 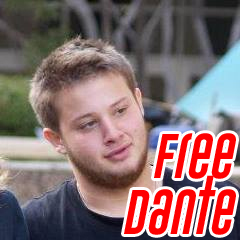 We need to stand behind Dante and all others that fight for their freedom in the streets. Dante was born and raised in San Francisco. Dante has not had an easy life and his battle against the system is mirrored by his own experiences growing up poor in the Bay Area. He has been involved in various struggles for liberation and has engaged in numerous projects that have involved the community and sought to build autonomy. Thursday, February 26th, 9 AM, Wiley M. Manuel Courthouse, 661 Washington Street and Broadway, Oakland. Department 112. This entry was posted on Wednesday, February 25th, 2015 at 12:44 pm	and is filed under Prison Struggle.